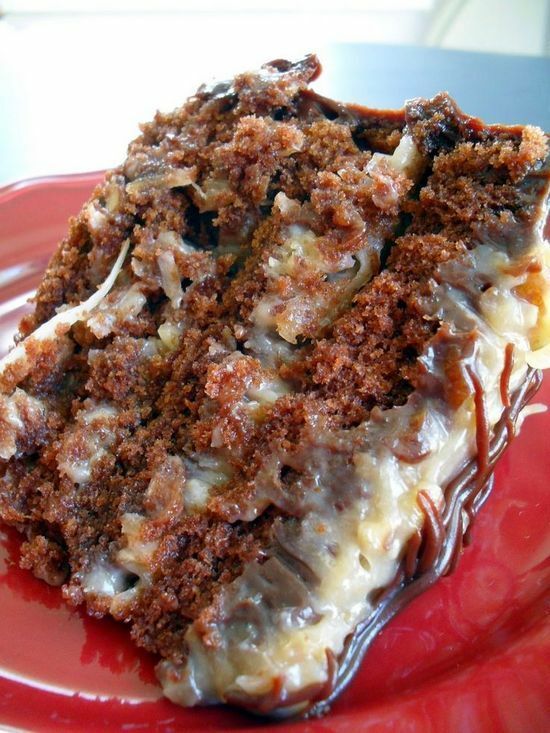 German chocolate cakes hardly needs any introduction. A tall, dark chocolate cake layered with a rich custard filling made of toasted coconut and pecans and then glazed with a dark chocolate ganache. How can anyone not like German chocolate cake? Sign me up for a breakfast slice (or two). This recipe comes barely adapted from David Lebovitz. What can I say, the man knows his German chocolate cakes. Ganache can also be intimidating if you don’t know your ratios. A high ratio of cream makes a good glaze but a bad frosting. Not enough cream and your will be too hard. So, because I love math, I thought I’d capture some standard ganache ratios and their applications. Divide the batter into the 2 prepared cake pans, smooth the tops, and bake for about 45 minutes, until a toothpick inserted into the center comes out clean. Cool cake layers completely. Heat the cream mixture and cook, stirring constantly (scraping the bottom as you stir) until the mixture begins to thicken and coats the spoon (an instant-read thermometer will read 170°). Pour the hot custard through a fine-mesh sieve into the pecan-coconut mixture and stir until the butter is melted. Cool completely to room temperature. Filling will be thick and sticky. In a small saucepan, heat the sugar and water until the sugar has melted. Remove from heat and stir in the dark rum. Place the 8 ounces of chopped chocolate in a bowl. Bring cream, corn syrup, butter to just under a boil in a small saucepan. Remove from heat and pour over the chocolate. Let stand one minute, then stir until smooth. Let sit until room temperature, about an hour. Chill in the refrigerator, stirring every 5 minutes, until ganache just barely begins to hold its shape and and has a spreadable consistency. Chill for an hour or two longer for a pipe-able consistency. 1 Response to "German Chocolate Cake"
Wow, really wanted to try this recipe but your site doesn't allow me to print it out right. Not worth coming back to your blog, which is too bad because this looks delicious.